i b i k e l o n d o n: Coffee, cake and cruising; I just can't get enough! Coffee, cake and cruising; I just can't get enough! This Saturday I'll be taking a grand tour of west London to join the good people behind "Bike Minded" on their coffee and cake cycling cruise. Bike Minded is the brain-child of the Royal Borough of Kensington and Chelsea. 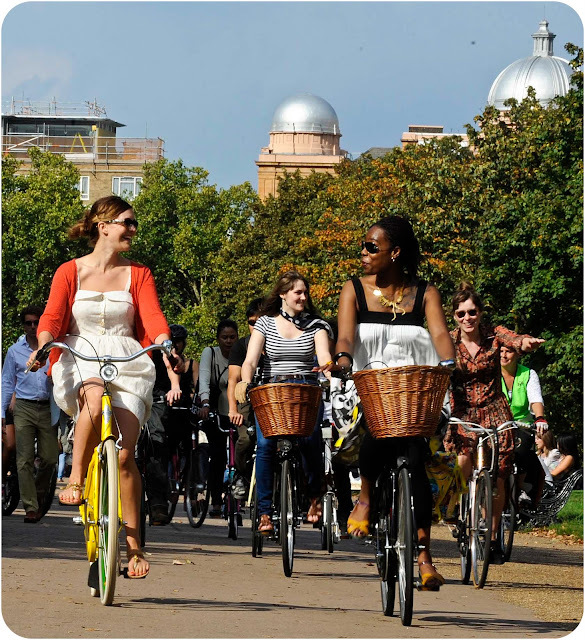 They're the people we've written about before here and who put on the 'Like Riding a Bike' photo exhibition - here at ibikelondon we love their work and only wish every local authority was as switched on about cycling! Saturday's ride is a gentle pootle to no less than four cake shops in the borough (when you ride a bike, you're immune to calories, right? )and a joint venture organised in partnership with the ever fabulous Jools over at Velo City Girl. This weekend's ride is already sold out, but follow the website for forthcoming news about more cake and coffee cruises and a forthcoming theatrical Hallowe'en ghost tour of the borough, as well as tips on maintaining your bike and getting around town as well as fantastic interviews with local 'bike heros'. Don't forget, dear readers, the 3rd Blackfriars flashride takes place next Wednesday the 12th October. It would be great to see you all there! Not sure I'm quite as cool as the guy in the video, but I loved it nonetheless! I must try and join a cake and coffee cruise next time I'm visiting London friends. It sounds like great fun. Hi Don, I suspect that most people who buy Ferraris aren't nearly as cool as they think, but that's the whole point of aspirational advertising I suspect. That's what this cycling 'advert' does very well, which is why I approve! Thank you for your very kind words too - have fun! Just to follow up on this post; the coffee and cake cruise was fantastic! The weather was cold but dry, the cake was delicious, the ride well marshalled and women far outnumbered men (a rare thing indeed on any organised bike ride!) 10 out of 10 to Bike Minded!